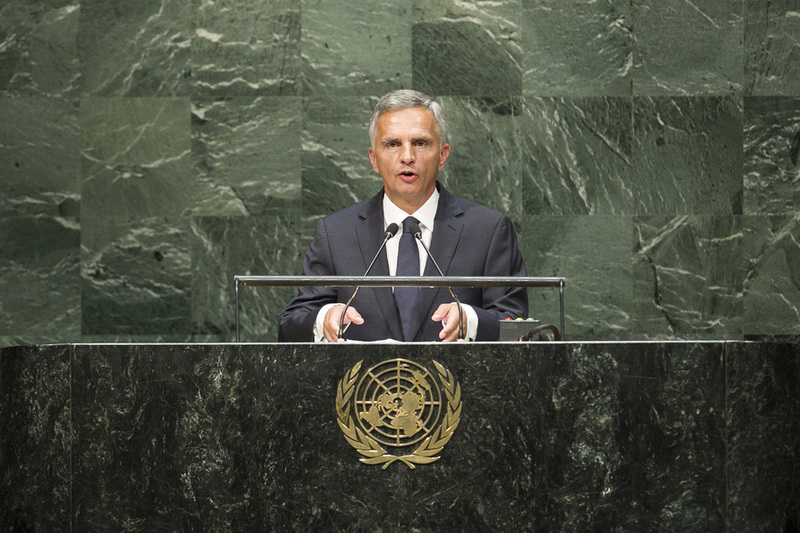 DIDIER BURKHALTER, President of Switzerland, echoed the words of Swiss youth activist Damian Vogt and girls’ education crusader Malala Yusufzai as he urged the international community to meet the aspirations of today’s youth. Like millions of other young people around the globe, they wanted exactly the same things: peace, human dignity, freedom and equality, and education, and an opportunity to work, he said. The United Nations must do everything in its power to give them a world where humanity was synonymous with security, freedom and prosperity. International security and United Nations reform was two priority areas and would enable the Organization to stay true to its roots as “an assembly of States at the service of the people borne out of the ruins of conflict”. Today’s security challenges were immense. Around the world, the rule of law and principles of humanitarian law had been flouted. Particularly worrisome were the developments in the Middle East, most notably the brutal acts of the “Islamic State” in Syria and Iraq. It was for that reason, he said, that nations must be united in the “supremacy of law over force”. When serious violations occurred, investigations must be carried out. Along with 60 other States, Switzerland had requested that the Security Council refer the situation in Syria to the International Criminal Court. At the same time, the root causes of extremism must be addressed. Switzerland had established the Global Community Engagement and Resilience Fund to provide support for projects that would strengthen education and civic engagement, and build capacity at the community level to provide alternatives to extremism. He said the situation in Ukraine “weakens the security of the entire continent”. Violations of international law in Crimea demanded a firm response by the international community, but one that was balanced and left room for dialogue and cooperation. To simply isolate Russia from the rest of Europe would not solve any problems. Stability could only be restored by working with the country, not against it. His country, in its capacity as Chair of OSCE, fully supported the contact group for Ukraine and Russia, and would take steps to increase funding for a civil monitoring mission in cooperation with the United Nations. Nations could make the greatest contribution to global security through conflict prevention, he said. The secret to stability and the heart of Switzerland’s history lay in a willingness to share power, engage in direct dialogue with minorities and distribute authority between central and local government. There must be an “emphasis on consultation rather than confrontation”. To manage global tensions, it was essential to strengthen the mediation capacities of both the United Nations and of regional security organizations. Wars could grow out of missed opportunities for dialogue, he warned. In the coming year, Switzerland would augment its contribution to global development and humanitarian cooperation through roughly 0.5 per cent of its national income. In closing, he said the post-2015 process was a unique opportunity to transform the world’s challenges into opportunities, however, certain crises could not await the outcome of discussions. Thus, Switzerland had decided to increase its humanitarian commitment in the fight against Ebola. Already, Swiss-based research centres, some of the best in the world, were working with WHO in the clinical testing of vaccines.